In this video, we show you how to perform CPR and use an Automated External Defibrillator (AED) on an Adult casualty you suspect has suffered a cardiac arrest. If a casualty is unresponsive, AND is NOT breathing effectively, the statistical likelihood is that they have suffered a Cardiac Arrest. Over 30,000 people suffer an ‘Out of Hospital Cardiac Arrest’ every year in the U.K. Every minute without CPR and defibrillation reduces the chances of survival by up to 10%. Performing CPR can more than double the chances of survival, in some cases. We offer a AED Defibrillator short courses. 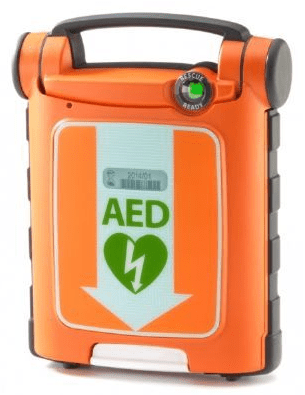 Defibrillator (AED) training short courses are designed for companies or individuals who wish to take the initiative to have an Automated External Defibrillator (AED) on their premises, and realise the benefits for the welfare of staff, as well as customers. This allows organisations to demonstrate best practice, and give all members of staff the confidence to use a defibrillator if they have to. Hi, this is Cory from the First Aid Training Cooperative and today we’re going to show you a video clip of how we deal with a non-breathing casualty if we have an AED available. So we’ve got a mannequin on the floor which is going to be our non-breathing casualty and a colleague Tom who’s going to help us with the AED demonstration. If this was a real incident and you came across a casualty the first thing you do is to stop and assess the danger to make sure the accident scene is safe. I’ll be thinking about putting on my gloves and then i’ll be checking to see if the casualty is alert. No response. Now, shout for help. You need to open the casualties airway with a head tilt chin lift and I need to check for breathing. And in the meantime while Tom does that I’m going to start our CPR process. So to start with compression. My hands go in the center of the chest, my arms are straight, and my shoulders over my hands. I’m going to do 30 deep compressions, five to six centimetres deep. Counts 1-30, at a rate of about twice a second. Gives two rescue breaths. Counts 1-30, at a rate of about twice a second. Give two rescue breaths. So to summarize using a defibrillator is an essential skill in first aid these days. If a defibrillator is available, use it. By watching this video you can now have enough skills to be able to apply a defibrillator. It’s a box, you turn the box on, the box has pads attached, you attach the pads to the casualties bare chest. You’ll have seen Tom in the video using scissors to cut through clothing to put the pads on to bare chest. If it was a man and he had a hairy chest or shoulders, a razor would shave the casualty so the pads went directly on the casualties bare skin. If the casualty was wet/sweaty, we have a cloth just to dry the skin before the pads go on. Once the pads are on the box takes over, listen to the voice and just do exactly what you are told. These boxes are lifesavers, they are so simple to use.